Sometimes I overthink things when I'm behind the GM's screen. Often this comes in the form of feeling the need to rationalize some detail that I added on the fly... you know, the kind of detail that sounds good at first but then you realize after you said it that it's actually flawed or unrealistic or irrational. But it's too late then! The players are already visualizing whatever you said, and now you need to figure out how to make it make sense. Players: Do we hear anything? Players roll and respond with high scores. GM: You can hear some gruff voices. Player: Can we tell what language they're speaking? GM (forgetting that one of the PCs knows orcish): It sounds like orcish. Player: Cool, my character knows orcish. What are they talking about? 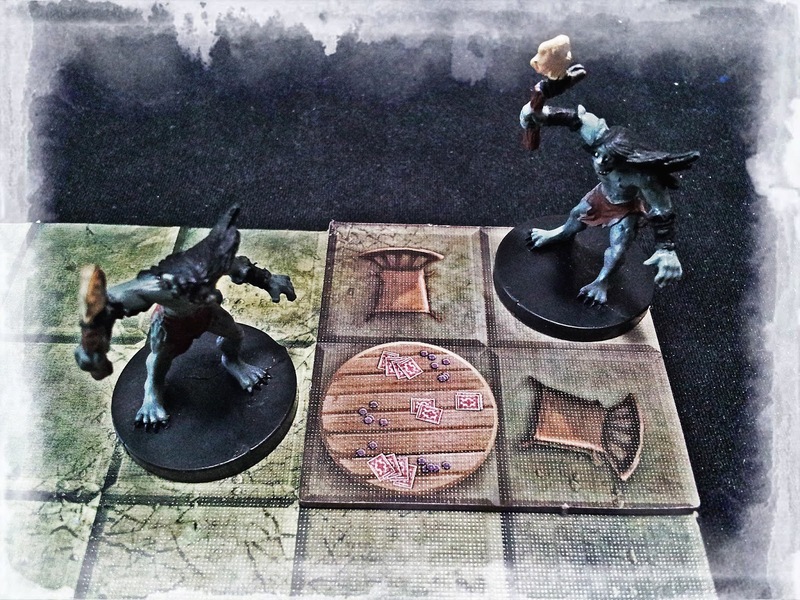 GM (glancing down at the Dungeon Tile piece with a card table and chairs that I've already placed in the room): It sounds like they're playing some kind of card game. So about midway through the ensuing combat, I started thinking about how I could make that verbal misstep sensible. While trying to manage combat and brainstorm a solution at the same time, the only thing I could think of was, "Somehow the cards have to be marked so they can play without seeing." When the battle was over, I described a deck of playing cards that looked as though each card had been poked with a knife just enough to mark it, with each card carrying a different mark. Maybe these grimlocks play cards by touch rather than by seeing the images on the cards. You never know, right? Side Note: I was pleased to find out that in real life, Braille playing cards are available. My idea was not quite as revolutionary as I thought it might be when I was thinking on the fly. In any case, my description of the cards probably took longer than my description of the rest of the loot in the room, and naturally the players were drawn to them. Perhaps I didn't highlight well enough during the encounter that these creatures are blind? Either way, they honed in on the description of the cards, thinking they must serve some purpose. Nobody in the party can cast detect magic, but I'm pretty sure they assumed the cards were magical, so of course they picked them up for further study. Then, while appraising the loot, a store owner actually made fun of the cards and said they were worthless. Not to be deterred, a second opinion was needed... and the cards were taken to Tauster, the local mage, to be identified. At this point, I realized that I was forgetting one of the most important rules of game mastering: Go with your players' instincts. If you've drawn enough attention to something to make it seem important, and you didn't plan for it to be a red herring, make it important even if you didn't originally intend it to be. I made several mistakes in this series of events. The first was forgetting the capabilities of the characters. While it happens all the time and rarely ruins a session, it's still a mistake. I threw out the orcish language thinking I wouldn't have to come up with a more specific answer to a question that was asked. The second was giving more description than was necessary. I was working too hard to rationalize something that the players didn't even act concerned about... at least until after I spent so much time talking about it. If I had just glossed over those cards, the group probably wouldn't have noticed anything was off. The third mistake was clinging to the idea that those cards were worthless. Who says those cards weren't somehow magical? So those random marked playing cards are magical now. Tauster the local mage said so. He (and the GM) just needed a little more time to figure out exactly what they do.